The 'friendly invasion' of American servicemen (and women) began in 1942 and by 1945 around three million had passed through the United Kingdom. With money in their pockets, a smart uniform, and access to goods the British housewife hadn't seen in the shops for many years they were generally popular but resented by some. Unfortunately, due to sales rights restrictions, we cannot offer Welcome to Britain for sale in your country. 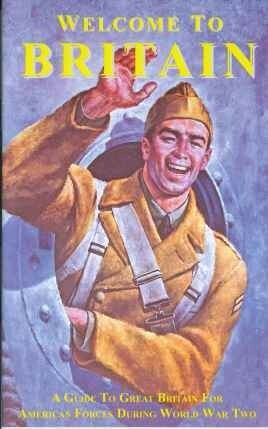 The 'friendly invasion' of American servicemen (and women) began in 1942 and by 1945 around three million had passed through the United Kingdom. With money in their pockets, a smart uniform, and access to goods the British housewife hadn't seen in the shops for many years they were generally popular but resented by some. The phrase 'Over-paid, over-sexed, and over here' being used to describe them in less than complimentary terms. This booklet was issued to American forces in an attempt to get them acquainted with the British, their country, and their ways, and avoid some of the more obvious misunderstandings that could easily occur without at least a little knowledge of the strange and wonderful British customs. Covering a diverse range of subjects such as, customs & manners, sports and pastimes, history and language, as well as some important do's and dont's, it is a delight to read and goes to show that some things haven't changed that much in the last 60 years since this was originally produced.